one of my teachers told me to 'draw every day'. It is the best advice I have ever received." French pastel artist, Sophie Amauger paints the landscape on location, with a sensitive command of color and light. Her background is in the graphic arts. Amauger studied at the Rennes School of Fine Arts in Brittany and the Brassart School of Graphic Arts in Tours. In 2000, she dedicated her work entirely to painting the landscape. Since then she has been named a Maître Pasteliste of the French Pastel Society. She exhibits her work in borth France and the Netherlands. 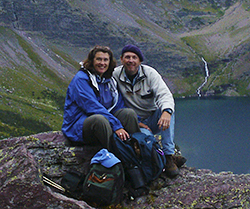 Amauger wrote to us about her childhood love of nature that continues to inform her work today. I was always very close to nature and, as a child, spent all my holidays on a farm. The smell of grass, the shade under the trees, the wind across the fields gave me a feeling of freedom, the same freedom I know when I start a painting now. As far as I can remember, I have always wanted to have an artistic job. At the age of 14, I had a painting course on Wednesdays. There, I discovered an unknown pleasure—the afternoon was always too short. At the age of 19, I went to the Rennes School of Fine Arts and completed my studies in a graphic arts school where I discovered many different mediums. That is where one of my teachers gave me the best advice I have ever received, "Draw everyday." After some years working in advertising, I discovered a box of pastels and I haven't stopped painting since. I paint en plein air and have never had another subject. I like painting the landscape because it constantly provides new challenges to solve. Amauger lives in the southwest of France and finds inspiration both nearby and in her travels. Living close to a small village, my house and studio are surrounded by fields. I find a lot of my subject there. I also travel two or three times a year to find new inspiration. I went to the Isle of Noirmoutier (Atlantic coast) in September and to the Vallée du Lot last October. In April, I will be in Andalousie, south of Spain, to feel springtime. What inspires me about this subject? Can I simplifiy it? Is there a focal point? How does the eye travel around the picture? We asked Amauger to tell us about her process and materials. I always start with the darkest value, going slowly to the light, on sanded paper (Pastelcard from Sennelier or UART paper). I have recently also started working on wood board prepared at the studio with marble powder in addition to working on paper. I really love Unison and Schmincke pastels. As I spend a lot of time choosing my composition with a small cardboard window, I directly start on my board, without thumbnail sketches. I only use fixative when my work is finished. I mostly paint in plein air on square format—12 x 12" or or 16 x 16". The largest paintings are realized in my studio, in winter, from those plein air studies. We asked Sophie Amauger the names of artists who have inspired her and what inspiration or advice she would like to pass along to other artists. My favorite historical artists are Alfred Sisley and Isaac Levitan. Through Facebook, I have discovered some wonderful painters that I would like to warmly thank. Looking at their work gave me confidence in my own artistic endeavors. 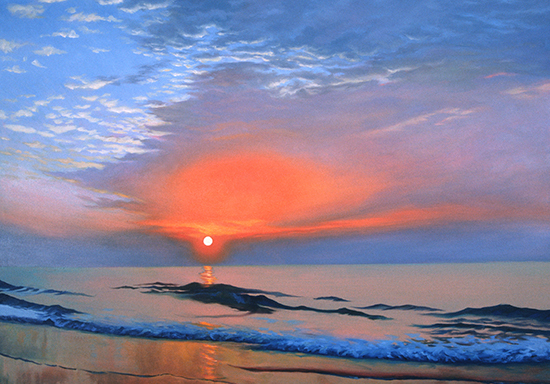 Some of my favorites are: George Carlson, for his large landscapes, and the feeling of freedom I find in them; Dean Fisher, for his landscape subjects; Brian Blood, for his command of light; David Sharpe, for his talent to try new experiences in representing the landscape, Julie Airoldi and Simon Bland. To a beginning artist I would say that to be proud of one's work is a trap which prevents you from moving forward. Doubting allows you to look and to find.